Virgo represents the “womb of time” wherein the spiritual seeker is slowly matured through profound crises. He needs to grow into the light of knowledge and learn to use his free will in a responsible way. When nature considers him mature she leaves him to himself for further evolution to higher consciousness. Our earth is also in a slow process of ripening in the womb of the Mother Nature. Virgo stands for the virgin nature of the Divine Mother. 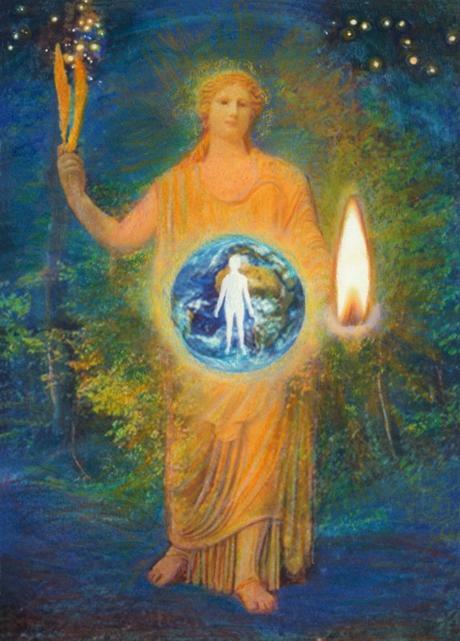 She is depicted with an ear of corn in one hand and a light in the other. They symbolise the spiritual food for the souls and the spiritual light which lightens the way. For the illustration of the Virgin I reworked a photo (by Sailko, Wikimedia) of a statue of Hera, the Greek queen of the gods. In her womb I placed a human silhouette on the globe surrounded by a field of light. The goddess is walking on a forest path. In her right hand she carries two ears of corn and in her left hand she carries a flame lighting the way. The ears are pointing to the Pleiades, the Seven Sisters, the mothers of the seven aspects of form life. In esoteric astrology, this constellation is deeply linked to Virgo. The different zodiacal signs are clustered in groups – you can see here all my Virgo paintings.